Amid the beautiful backdrop of the Texas Hill Country, you’ll find luxurious homes and first-class amenities waiting for you in the master-planned community of Travisso. Now, it’s easier than ever to find your first or next new home during our fall Tuscany Home Tour. Join us on Saturday, Sept. 23 from noon to 3 p.m. or on Saturday, Sept. 30 from 1-4 p.m. During this two weekend event tour eight beautiful model homes and view over 30 inventory homes. Fall treats, giveaways, refreshments, and something for everyone. During the event you’ll have the opportunity to explore a multitude of inventory homes with a variety of floor plans and options. Whether you prefer a one story or a two story home, there’s plenty to choose from. Square footage ranges from 1,900 sq. ft. to over 4,500 sq. ft. Travisso also offers an array of national builders including Toll Brothers, Taylor Morrison, Drees Custom Homes, and Highland Homes. 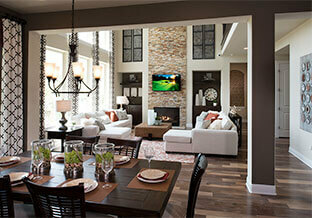 While exploring Travisso don’t forget to tour The Palazzo, our awarding winning clubhouse. The Palazzo encompasses 9,200 sq. ft. of outdoor and indoor recreational space. Outside, relax in the sunshine then refresh in the resort-style pool or splash pad. The pool area’s open air pavilion boasts a large fire pit for roasting s’mores. Shaded and unshaded deck areas complete the patio. After a quick swim enjoy a game of tennis at one of two lighted tennis courts. A playground and recreational soccer fields provide hours of fun and activities for kids. Experience and explore all Travisso has to offer. On your visit discover our world-class amenity center, unbelievable views of the Texas Hill Country, and a vibrant community alive with spirit. During our Tuscany Home Tour come for the view, stay for the lifestyle. Travisso—your place to call home; your place to relax; your place to explore.